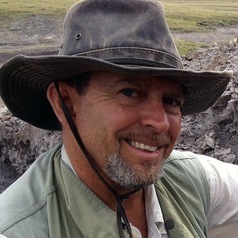 Tony is a paleontologist and geologist, with a research specialty in ichnology, the study of modern and ancient traces caused by animal behavior, such as tracks, trails, burrows, and nests. He has published more than a 150 research articles and abstracts, and some of his fossil discoveries – which include the first known burrowing dinosaur – have received wide attention in popular media. He is the author of six books, including two editions of a popular dinosaur textbook (Introduction to the Study of Dinosaurs), and his most recent book is Dinosaurs Without Bones: Dinosaur Lives Revealed by Their Traces Fossils (2014, Pegasus Books).